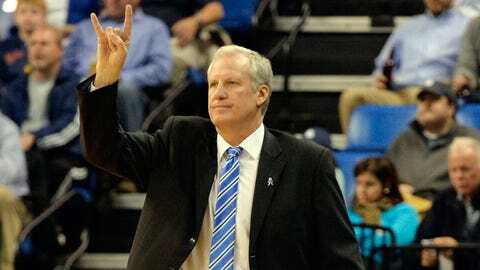 Jim Crews and the Billikens are riding a nine-game winning streak and ranked 24th in the latest AP Top 25 poll. ST. LOUIS — Saint Louis made its 2013-14 debut in the Associated Press Top 25 Monday but coach Jim Crews was not exactly excited. Crews was unaware the Billikens even had cracked the rankings until he met with the media before Monday afternoon’s practice. Even more than most coaches, Crews prefers to focus on the process and says he is content when he sees steady improvement in his team. He has plenty of reason to be content these days with the Billikens on a nine-game winning streak and coming off as impressive a game as they’ve played all season, a 67-59 victory at Dayton Saturday. Senior guard Jordair Jett should be feeling fine, too. He was named Atlantic 10 Conference Player of the Week after scoring 31 points and the winning points at Rhode Island and contributing 12 at Dayton. This week: at George Mason Wednesday, at Elon Saturday. Last week: Beat St. Joseph’s 66-62, beat St. Bonaventure 73-68. The Minutemen have moved up to third in the RPI rankings and to 16th in the AP Top 25 but not all is awesome in Amherst. They are struggling at the start of games, even at home. They fell behind 16-5 against St. Joseph’s and trailed by seven at the half against St. Bonanventure. Senior guard Chaz Williams rescued UMass with 22 points against St. Joseph’s but managed only eight on 1-for-7 shooting against St. Bonnie and did not appear to be moving well. This week: St. Bonaventure Wednesday, Fordham Saturday. Last week: Won at Rhode Island 59-58, won at Dayton 67-59. The Billikens have a week at home before they get a chance to improve their nation-best 6-0 road record. This week: At George Washington Tuesday, Duquesne Saturday. Last week: Beat Stony Brook 81-63, beat George Mason 71-57. The Rams’ trapping defense never has been better at forcing steals. The nation’s leader in steals the past two seasons, VCU is No. 1 again with an average of 13.0. Once again, Briante Weber is the lead thief. The nation’s leader with an average of 4.0 a game, Weber is well ahead of a pace that would break the single-season school record he set last season as a sophomore. He had 12 steals in two games last week. This week: Rhode Island Wednesday, Temple Saturday. Last week: Beat George Washington 76-72, won at Duquesne 75-56. The Explorers have won four of five and there’s no secret to their success. They’ve held the opposition to sub-40 percent shooting in each victory. Senior guard Tyreek Duren, who has overcome a bout with plantar fasciitis, has been key to the team’s improvement. "He’s been more like himself," coach John Giannini said. "He makes a huge difference." This week: VCU Tuesday, at St. Bonaventure Saturday. Last week: Lost at La Salle 76-72, Beat Rhode Island 69-56. Not even coach Mike Lonergan saw his young team being this good this quickly. "I didn’t think we’d be 13-3 but I thought we’d have a winning record," Lonergan said of a team that went 13-17 last season. The Colonials have their best chance of the season to show just how much they’ve improved when they play host to VCU, a team that spanked them by 27 in their only meeting last year. This week: At Fordham Wednesday, at Richmond Saturday. Last week: Won at Mississippi 83-80 (OT), lost to Saint Louis 67-59. If anyone in the land should be impressed with Saint Louis’ defense, it has to be Dayton senior forward Devin Oliver. He was skunked by SLU on 0 for 12 shooting just one game after he had hit a 3-pointer at the buzzer, shot 11 for 14 and scored 26 in an upset at Mississippi. "That’s a tough one," Oliver tweeted after the SLU beatdown. This week: Duquesne Wednesday, at Penn Saturday. Last week: Lost at Massachusetts 66-62, won at George Mason 84-80. For the first time in the past four seasons, the Hawks played a game without the services of forward Ronald Roberts Jr., who sat out against George Mason with back spasms. The team hopes to have their second-leading scorer back this week. This week: At Saint Louis Wednesday, George Washington Saturday. Last week: Beat Richmond 84-70, lost at Massachusetts 73-68. The Bonnies looked like a fairly easy W for SLU a week ago. Then they scored an impressive victory over Richmond and almost pulled off an upset at Massachusetts. St. Bonaventure led by 13 with 10 minutes to go before the Minutemen closed with a 26-8 run. "We went toe to toe with the best team in the league," St. Bonaventure coach Mark Schmidt said. "It should give our guys confidence that we can compete and be there at the end." Too many turnovers (20) against Massachusetts’ full-court press led to the Bonnies’ demise. Last week: Lost at St. Bonaventure 84-70, won at Fordham 77-74 (OT). The Spiders returned to class Monday and have all week to settle back into their routine. Look for them to use some of the extra preparation time to work on free-throw shooting. They are shooting just 56.3 percent from the free-throw line over their past six games. This week: At La Salle Wednesday, George Mason Saturday. Last week: Lost to Saint Louis 59-58, lost at George Washington 69-56. After playing SLU as tough as nearly any team this season only to lose in the final minute, the Rams did not bounce back very well. In their next game, they fell behind George Washington 37-13 at the half, a mark of inconsistency that comes with relying on three freshmen. This week: at St. Joseph’s Wednesday, at VCU Saturday. Last week: Beat Fordham 87-81, Lost to La Salle 75-56. The Dukes had a five-game winning streak snapped against La Salle. They will be hard-pressed to approach another such streak now that conference play has started. This week: Massachusetts Wednesday, at Rhode Island Saturday. Last week: Lost at VCU 71-57, lost to St. Joseph’s 84-80. In their first season in the Atlantic 10, things are slipping away from the Patriots. They have lost nine of 12 and face a couple of tough tests this week. This week: Dayton Wednesday, at Saint Louis Saturday. Last week: Lost at Duquesne 87-81, lost at Richmond 77-74 (OT). The Rams have lost four straight but 6-3 freshman Joe Severe continues to pour in the points. He leads the conference in scoring after going for 35 points at Duquense, his third game this season of at least 30. Severe is shooting only 36.1 percent, though, which does not bode well for his chances of having a big game at SLU on Saturday.